Our work in Sierra Leone focuses on supporting new approaches to natural resource management. Sierra Leone has a wealth of natural resources. In addition to vast reserves of diamonds, Sierra Leone is rich in many other minerals. Cocoa, coffee, and fish also register amongst the country’s main exports. Eight out of 10 Sierra Leoneans work in agriculture, while artisanal mining provides a source of income for approximately 120,000 people. A majority of the country’s diamonds are extracted by artisanal miners. Diamonds also have the distinction of having played a critical role in Sierra Leone’s civil war. Rebels exploited the country’s diamond resources to fund hostilities against the government, drawing out the conflict. Since the end of the war in 2002, Sierra Leone has seen tremendous economic and social progress. However the country still struggles with corruption and poor infrastructure. The majority of the population is living in poverty, lacking full access to education and health services. Sierra Leone is a member of the Kimberley Process and is required to put in place internal controls that certify the origin of its rough diamonds as conflict-free. Internally, the country has pursued various mineral sector reforms and attempts to reduce corruption. Despite these efforts Sierra Leone still struggles with the illicit trade of diamonds and other minerals, losing important tax revenue. It is a member of the Regional Approach for the Mano River Union, collaborating with its neighbours Côte d’Ivoire, Guinea, and Liberia to strengthen KP compliance. Sierra Leone is one of the top diamond producing nations in the world. Other key natural resources include titanium, bauxite, gold, and wildlife. Our research in West Africa investigates the drivers of the illicit trade of conflict-prone natural resources and highlights recommendations for the region’s countries, including Sierra Leone. We examine issues such as formalization of the artisanal mining sector, fiscal reform, harmonization of legislation, and strengthening of internal controls to end smuggling. We also provide analysis of certification, traceability, and due diligence as it applies to diamonds and gold in the region. 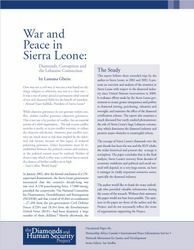 In 2000, we published The Heart of the Matter: Sierra Leone, Diamonds and Human Security—one of the first reports that drew the link between diamonds and conflict financing in Sierra Leone. During the trial of Liberia’s former President Charles Taylor at the Special Court for Sierra Leone, IMPACT’s researcher and author of the report, Ian Smilie, testified about our investigation. Taylor was found guilty of war crimes and crimes against humanity. As part of our work to transform mineral supply chains, we’ve led efforts to support traceability and due diligence, while promoting benefits for Sierra Leone’s miners and their communities. We are a member of the technical team supporting the KP Regional Approach for the Mano River Union, supporting the implementation of a regional strategy to address the illicit trade of diamonds and KP compliance. We share best practices on diamond governance and provide capacity building to Sierra Leone’s stakeholders, including policymakers, private sector, and civil society actors on the implementation of KP internal controls and OECD Due Diligence Guidance for Responsible Supply Chains of Minerals from Conflict-Affected and High-Risk Areas. Through our collaboration with the KP Civil Society Coalition, we provide support to our partner in Sierra Leone to participate in the KP, as well as support and spotlight their capacity for independent monitoring of KP internal controls and due diligence in the natural resource sector. We advance dialogue with our partners in Sierra Leone, including policymakers and the private sector to implement traceability and due diligence as well to ensure benefits reach miners and their communities. We have a longstanding collaboration with our civil society partner, Network Movement for Justice and Development (NMJD) and supported the Campaign for Just Mining in Sierra Leone—the first African civil society coalition addressing the illicit trade of natural resources. Today, through our partnership with the KP Civil Society Coalition, NMJD and other civil society from West Africa, bring the voices and concerns of artisanal miners to industry and governments. Together, we engage governments to strengthen their internal controls, and encourage the private sector to put in due diligence for their mineral supply chains. IMPACT is a member of the technical team supporting Côte d'Ivoire, Liberia, Guinea, and Sierra Leone in developing a joint plan to address the illicit trade of diamonds and to ensure Kimberley Process (KP) compliance through the Regional Approach for the Mano River Union. Rich Man Poor Man reports on months of research in the diamond fields of Sierra Leone, Angola and the Congo. There, alluvial diamonds represent the primary source of income for more than one million freelance diggers and their families. On average, however, they earn only a dollar a day. Working conditions are unhealthy and dangerous; cheating, theft and smuggling are rampant. This report exposes the continuing crises of armed violence in the West African sub-region by highlighting the role and influence of diamonds and concludes with recommendations for the UN Security Council and the Kimberley Process. Provides an overview and analysis of the situation in Sierra Leone with respect to the diamond industry since the UN intervention in 2000 and examines the role of Sierra Leone’s Lebanese community in the diamond industry. This study of the Sierra Leone diamond trade and its international connections demonstrated the centrality of diamonds to that country’s brutal conflict. Download the summary version.